The 2" corrector for RC corrector offers optimal field correction and illumination (45mm diagonal) for sensors up to FullFrame (24x36mm). 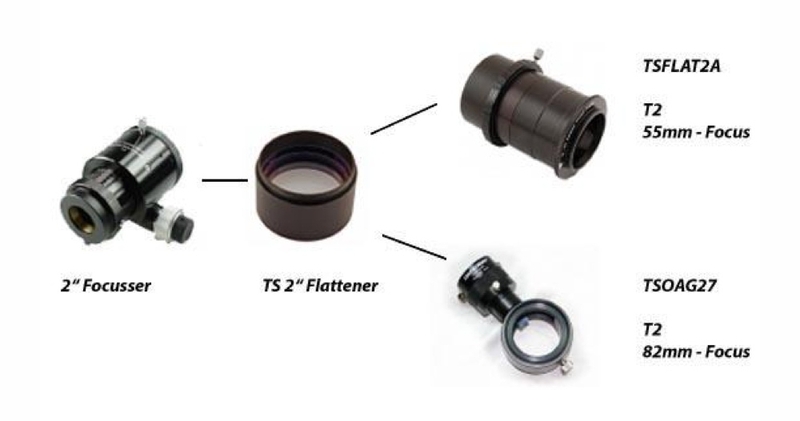 When the camera's sensor diagonal is larger than 25mm, we recommend this flattener. On camera side this corrector has M48x0.75 thread with an optimized working distance of 109mm so there's a lot of space to install many astrophotography accessories. With 109mm back focus, this RC flattener offers enough space to integrate additional accessories like off-axis-guiders, filter wheels or filter drawers.